The Kubi telepresence robot revolutionizes video communication. 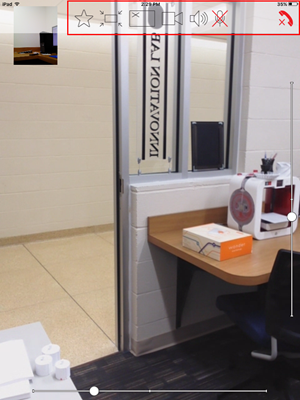 With Kubi, you can video chat from a computer or tablet onto an iPad or other tablet device while remotely controlling what direction the tablet on the Kubi faces. 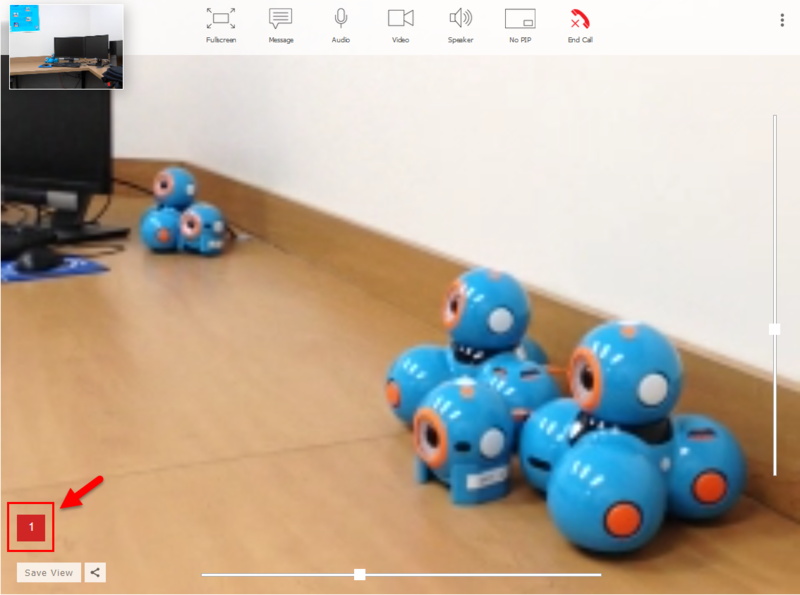 The Kubi makes video conferencing more interactive than ever before. 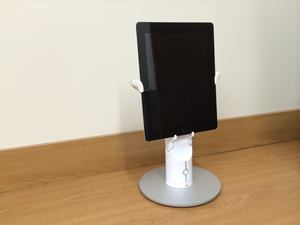 Connect to a Kubi device via a computer or tablet. This article will refer to the two ends of the connection as the Receiving end and the Connecting end. The Receiving end is the side of the conversation that is with the actual Kubi. The Connecting end is the person with the computer or tablet device that is connecting to the Kubi. Note: Bluetooth must be enabled on the receiving end tablet in order to make a connection. 1. A computer with a Google Chrome or Mozilla Firefox browser installed. 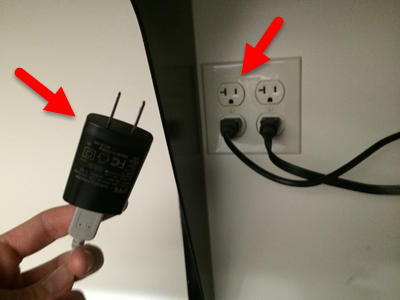 Step 1:Using the provided wall charger, plug in one end of the charger into an outlet, and the other end into the Kubi. 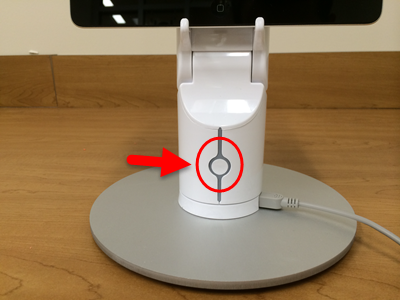 Step 2:Turn on the tablet and then turn on the Kubi device by pressing the power button. 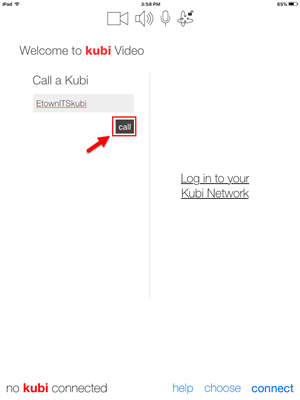 Step 3:Open the Kubi Video app on the tablet. This app can be downloaded from the App Store on iOS devices, or from Google Play on Android devices. The tablet's screen should look like this when it's ready to be connected. Step 4:When receiving a call, press accept at the bottom of the screen to make a connection. 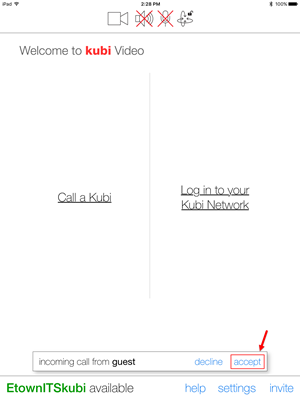 Once all of the instructions have been followed on the Receiving End, proceed with the following steps to connect to the Kubi from your computer. 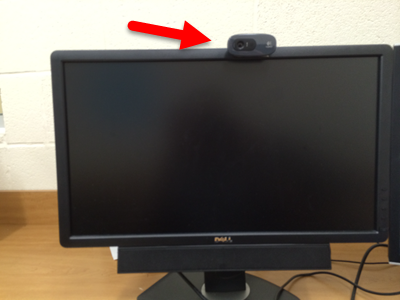 Step 1:Ensure that a microphone and webcam are probably installed on/connected to your computer. 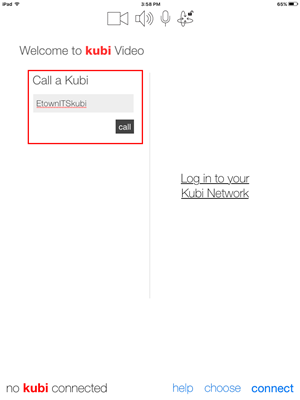 Step 2Type https://www.kubivideo.me/call/EtownITSkubi into your browser on the computer. Note: You must be using either Google Chrome or Mozilla Firefox. 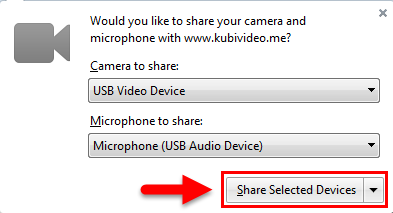 Step 3:Click Share Selected Devices. Your computer should automatically connect to the Kubi after pressing this button. 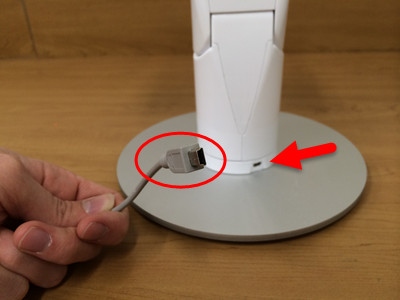 Warning: Do not have the Kubi in the same room as the computer you are connecting it to. The devices' microphones will interfere with each other and produce a high frequency screech. 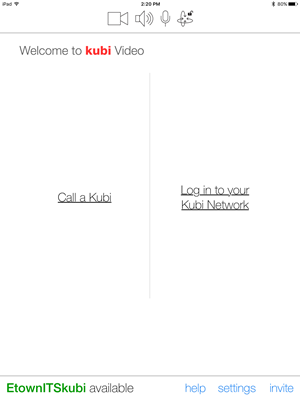 Step 1:Open the Kubi Video app on your tablet. This app can be downloaded from the App Store on iOS devices, or from Google Play on Android devices. 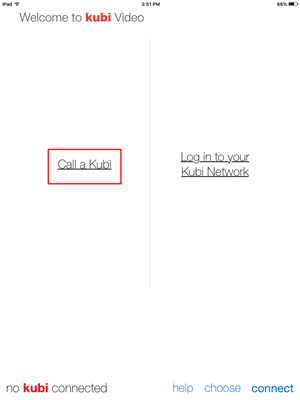 Step 2:Press Call a Kubi. Step 3:Enter "EtownITSkubi" in the indicated box. You have now successfully connected to the Kubi. 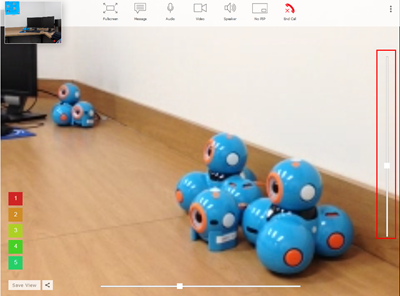 When connected to a Kubi, the person on the Connecting End will be the only one that controls which direction the tablet on the Kubi faces. 1. Fullscreen - Tap to toggle full screen mode. 2. Message - Tap this icon and type on your keyboard to display a message on the receiving end's screen. 3. Microphone- Toggle microphone on or off (i.e. what the receiving end hears from their speaker). 4. Video - Toggle video playback on or off for your screen (i.e. this controls what the receiving end sees). 5. Speaker - Toggle audio on or off (i.e. what you hear from your speaker). 6. No PIP - Tapping this icon will toggle whether or not to have a little frame of yourself in the top left corner of the screen. 7. End Call- Ends the call. Use the indicated horizontal slider bar to move the Kubi side to side. Use the indicated vertical slider bar to change the tilt of the Kubi. You can also move the Kubi around by clicking on different parts of your screen, or by using the arrow keys on your keyboard. Lastly, click Save View at the bottom left-hand side of your screen to save the specific direction and angle that the Kubi is positioned at. Press the colored numbers on the side to return to the saved positions. You can save up to five views. 1. No PIP - Tapping this icon will toggle whether or not to have a little frame of yourself in the top left corner of the screen. 2. Video - Toggle video playback on or off for your screen (i.e. this controls what the receiving end sees). 3. Speaker - Toggle audio on or off (i.e. what you hear from your speaker). 4. Microphone- Toggle microphone on or off (i.e. what the receiving end hears from their speaker). 5. End Call- Ends the call. You can also change the direction that the Kubi faces by single-tapping at different parts of the screen.